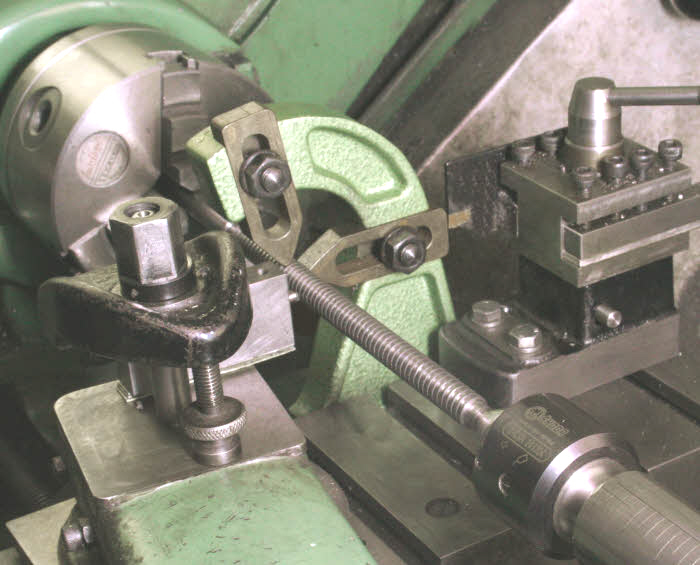 If your lathe is not supplied with gears in increments of five, or the leadscrew is other than 8TPI, then the list can still be used but a little calculation will be required as follows. When the leadscrew is other than 8TPI, say 10TPI, multiply the required pitch by 8/10 and look up that value. Say a thread of 15 TPI is required, this will give 15 x 8/10 = 12 look up twelve and use one of the values listed. If say your gears are in increments of four, then, typically, in the lists read 16 for 20, 20 for 25, 24 for 30, etc. and the ratios will be maintained. However, this does not apply to combinations that have either the 21 or 38 tooth gears in them. Resulting TPI = Leadscrew TPI x (N1 x N2 x N3)/(R1 x R2 x R3) where N and R are the driveN and driveR gears. Metric pitches on an Imperial lathe. As the lists detail each value in terms of TPI the easiest way to use them for metric threads is to convert the metric pitch to TPI. This is easy, just divide 25.4 by the metric threads pitch and look up the resulting value. For example, take a pitch of 3mm. 25.4 divided by 3 gives a value of 8.4667TPI, look for this value in the appropriate list. Not surprisingly, an exact match is not available but there are 11 combinations that result in a value of 8.4656 TPI, an error of just under two one hundredths of one thou between adjacent threads. The Data is for a lathe having an 8TPI lead screw and with 14 changewheels of 20 to 75 teeth in increments of 5, plus gears of 21 and 38 teeth. The lists show that in almost all cases there are many combinations that produce the same result, if therefor the viewer does not have the full set it is very likely that there will still be a suitable combination using those available.